Your volume can't be reduced below maximum. Ben Brode is a former Blizzard employee and member of Team 5 who served as Game Director for Hearthstone until his departure from the company on April 20, 2018. He is currently the Chief Creative Officer at the game studio Second Dinner. Brode is featured in the credits card of the same name. As one of the game designers for Blizzard Entertainment's Hearthstone™: Heroes of Warcraft™, Ben Brode [was] involved in all aspects of the design, including core gameplay design, card powers, balance, artwork selection, programming, and writing. Brode joined Blizzard Entertainment in 2003, and during his tenure has served in numerous roles throughout the company. His first role was as a tester on Warcraft III, followed by a position in quality assurance on World of Warcraft®. Before joining the Hearthstone team, Brode was part of Blizzard’s creative development department, in charge of licensed products. In his free time, Brode stays true to the rap game as an MC and beatboxer. Brode started his Blizzard career as a "night crew game tester". In 2002 Brode was working part-time delivering pizzas, and a friend of Brode's who was working at Blizzard in night shift Q&A convinced the team to order from Brode's pizza firm, allowing Brode to make connections within the team and eventually get a job as a night shift game tester for Warcraft III: The Frozen Throne and later QA on World of Warcraft. Brode "loved the job", got involved in testing the level editor and eventually began making his own maps for Warcraft III, which led him to learn about game design. Brode later worked on the World of Warcraft Trading Card Game from its "very beginning" until 2008, when Team 5 was created and work on Hearthstone began. Brode describes this as "how I ended up on the Hearthstone team", stating, "I caught the attention of [then executive producer Rob Pardo] and when they spun up Team 5, I got in!" Brode appears to have been one of the first members of Team 5, describing the team as having had "maybe" 2 members when he joined. Early in the game's development, prior to the beginning of prototyping, deadlines for another Blizzard project caused all of Team 5 except Eric Dodds and Brode to be reassigned to that game. This isolation allowed the two designers to work in an even more focused way, with only the two of them to settle prototyping decisions, and were able to rapidly progress through myriad design iterations. The two went on to establish the core game still found in Hearthstone today. For most of the game's initial development, Brode and Dodds were the sole designers regarding card changes and balance. Brode was also responsible for choosing the card art for all cards. Describing himself as "mostly the guy who heads up content design", up until Whispers of the Old Gods Brode was responsible for initial card design, and would sometimes also program prototypes of new mechanics, as well as working "a lot" with the dialogue and voice actors for the game's soundbites and sound design. At some point in 2015, Brode attended a Design Summit, an event internally hosted by Blizzard every few years where designers from around the company get together and share ideas. Brode gave a talk about various design lessons he had learned from improvisational comedy, stating that he had been in an improvisational comedy group "a long time ago". In late 2015 Brode was promoted from Senior Game Designer to Lead Designer. In November 2016 his title changed again to Game Director (a title previously held by Eric Dodds) although Brode had already been filling the role for around a year. Brode was now less involved in initial design and card creation, with more of a focus on "helping guide teams" and "leadership and direction stuff", but was still "very involved" in the overall design process. Aside from his work on the game itself, Brode was known for being active on Twitter and reddit, where he could often be found discussing the game with players. Brode was also the host of the Designer Insights video series, discussing current game design issues with the community. By far the most communicative member of the development team, Brode rose to prominence during the game's beta, quickly becoming the public face (and voice) of the Hearthstone team. In March 2017, in response to a petition on reddit asking him to "sing a song" for the upcoming Journey to Un'Goro, Brode released "Un'Goro: The Journey", a video featuring himself rapping, on his personal YouTube channel. Within a few hours the rap's reddit post had become the all-time most upvoted post on /r/Hearthstone, and soon the number one post on all of reddit at that time. The rap quickly saw a number of remixes from community members, setting Brode's voice to music ranging from hip hop and synthpop to the internet phenomenon "We Are Number One" and even tech metal, as well as overlaying Brode's rap over the original cinematic. Brode composed, performed and recorded the rap himself without assistance from other team members, taking him about 90 minutes to write. Brode states that he had been rapping "on and off" for 18 years at the time. In July 2017, following the announcement of the Knights of the Frozen Throne expansion, Brode starred in Hearthstone: The Lich King Interviews for a Job at Blizzard, a short video on Hearthstone's official YouTube channel which features the Lich King unsuccessfully attempting to get a job at Blizzard through a job interview with Brode. In early August, Brode appeared again in both Part 1 and Part 2 of The Lich King at Blizzard, a two-part video series in which the Lich King temporarily manages to land a job at Blizzard. During the initial announcement of Knights of the Frozen Throne, players were quick to notice the lack of a song in the expansion's trailer, prompting the creation of a new reddit petition asking Brode to once again perform a song. On July 31st, Brode released the rap video "Ben Brode - ARTHAS" on his personal YouTube channel, telling the story of how Arthas Menethil became the Lich King by recounting the events of Warcraft III: Reign of Chaos in rap form. Brode created the video in his home during his free time, taking about 20 hours to write and 40 hours to record and edit. He wrote the lyrics to the rap by himself. In the YouTube video's description, Brode extends special thanks to all of Team 5, and especially Andy Brock for mixing the soundtrack. On April 20, 2018, Brode announced that after 15 years at Blizzard and almost 10 years of working on Hearthstone, he would be departing from Team 5 and from Blizzard to instead help start a new company, citing a desire to be more directly involved in the creation process after his position at Blizzard became more focused on direction than actual design. He later elaborated that he hadn't worked directly on Hearthstone card sets for a long time, and that his job during his last 2 years at Blizzard had mainly consisted of granting approval to the developers who were "actually doing stuff". On July 12, 2018, the company Brode helped start was unveiled as the game studio Second Dinner, with Brode as Chief Creative Officer. "Hope you draw some lucky hands today!" Brode is well-known for his resonant voice and hearty laugh. This is referenced in his credits card's text - "Your volume can't be reduced below maximum". As of March 2016 Brode has not voiced any of the cards or characters in the game, although he did contribute one of the many voices heard in the tavern's background chatter. Brode however regularly provided voice overs and introductions at events such as BlizzCon, when presenting Hearthstone and other games such as World of Warcraft, described by former World of Warcraft designer Ghostcrawler as "the voice of god". Brode has described Lord Jaraxxus as his #1, #2, #3, #4 and #5 favourite cards. Lord Jaraxxus was also designed either primarily or entirely by Brode. 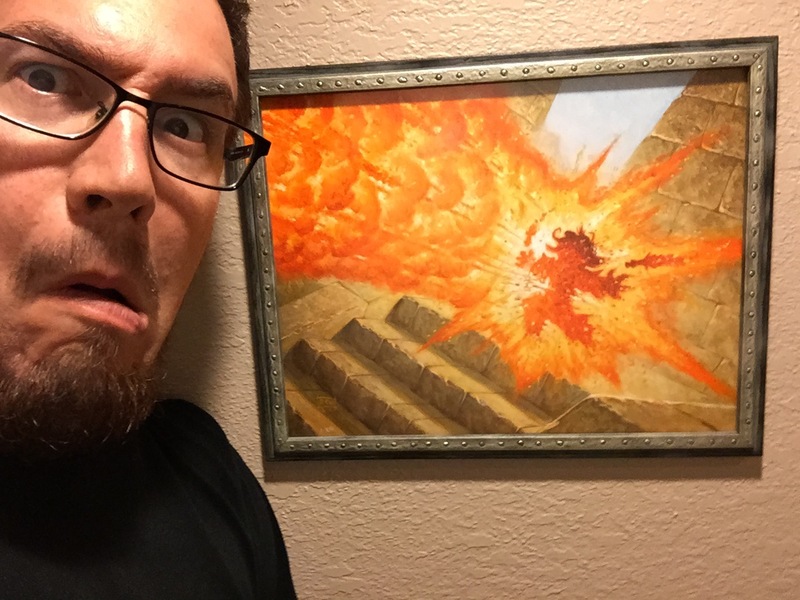 Brode owns the original print of the card art for Fireball. When asked how much he enjoyed his job at Blizzard out of 10, Brode replied "straight up 10". When asked what was likely the worst decision in the history of Hearthstone, Brode replied "maybe not nerfing cards that grant Charge enough the first time? ", specifically referring to Warsong Commander. Brode is credited as artist for the WoW TCG card "Hearthstone", released in 2006, long before Hearthstone was conceived. Brode describes it as an "incredible coincidence". Despite the listing Brode describes himself as "barely the artist", crediting Glenn Rane for the art's final appearance. Brode is paid tribute to in World of Warcraft through several items and NPCs, such as the fishing trainer Ben of the Booming Voice, and in the flavor text of the Tome of the Lost off-hand item which states "The title reads 'The Brode to Nowhere'". With the Warlords of Draenor expansion, Brode is fully realised as wandering salesman NPC Benjamin Brode, complete with a chequered shirt, who wanders players' garrisons selling a variety of Hearthstone-related novelty items. When interacted with, he says "I am SUPER excited to be here today!". A later patch added another NPC by the name of Remington Brode, a wandering lumberjack who can be found roaming across the Grizzly Hills in Northrend. Selecting the correct dialogue options while talking to Remington will cause him to give the player a music roll they can use to play the Grizzly Hills' iconic music in their garrisons. Players also have the option of telling Reminton that they would rather be in a tavern, which will prompt him to say that "If there's a game of Hearthstone going on there, you'll probably find my father as well". The same chequered shirt seen on both his World of Warcraft avatars can also be seen on Brode's credits card art, as well as in his 2014 official image (see right). When asked whether this was a coincidence or an intentional match, Brode humorously replied, "I am just always wearing that shirt". While Brode has since broadened his tastes to include chequered shirts of other colours, the chequered shirt has quickly become a signature of the developer. Brode states that his flannel habit began many years earlier with a sale at Costco, and that that his favorite brand of flannel shirts is J.Crew. In 2016 the official Blizzard gear store released a "Hearthstone Flannel Jacket", reflecting the implicit connection between Hearthstone and the popular pattern. The Lich King Interviews for a Job at Blizzard references the chequered shirts several times: the sign outside Brode's office features the pattern; Arthas describes the Blizzard office as a "sweltering bastion of flannel" after being dismissed by Brode; and the video's description raises the question "Will Ben Brode finally accept that it’s summer and lose the flannel?". Brode plays World of Warcraft. As of April 2016 his main is a Brewmaster monk. He has also mentioned playing "a buttload" of Heroes of the Storm. Brode has all the mounts from the Argent Tournament. He also played "a lot" of Warcraft II when he was younger. Brode "freaking loves" the card game genre, and cites having played Magic: The Gathering, OverPower, Wyvern, Netrunner, the Pokémon Trading Card Game, Battle Spirits, the WoW TCG, the Mortal Kombat TCG, and Rage. Brode has become the focus of a number of Hearthstone memes, many involving his laugh. In 2016 Senior Game Producer Yong Woo created an internal wiki document to collect the memes, appealing to his Twitter followers to contribute. Brode is currently working on a "meme review" video showcasing his favorite Hearthstone memes, though if he had to choose his favorite one, he has stated a particular fondness for 4 mana 7/7. When asked about favorite deck to play in Hearthstone's history, including open beta, Brode stated that he has "always loved" Control Paladin, and that he also loved Yogg-and-Load. Brode is "definitely not" (read: absolutely is) featured on one of the wanted posters in the background of Sergeant Sally's card artwork. Warcraft III maps worked on by Brode include "Worm War" and "Clash of the Footmen". During the game's first April Fools season on April 1st 2014, Brode was featured in reddit.com's /hearthstone channel's "Ben Brode day!" celebrations. All poster icons were replaced with a picture of Ben Brode, while the up and down-vote icons were replaced with alternately inverted images of his head. In the top-left corner of the screen a small figure boasting an oversized copy of the same image of Ben Brode's head greeted readers with the salutation "Brodies!" when moused over. Top comment apparently belonged to none other than Brode himself, posting shortly after midnight with the simple message "WHAT IS HAPPENING". Following Brode's departure from Blizzard, the /r/hearthstone subreddit temporarily changed its header image to an edited version of Leonardo da Vinci's 15th-century painting The Last Supper, with Brode in the center and various famous cards as other persons around him. Brode recording a voice over for BlizzCon. "When I had to record last-minute lines for BlizzCon VO, we had to do it in the only quiet place at the Con: the bathroom behind the main stage." Ben Brode and Bryan Chang performing at Blizzard's 2009 Guitar Hero competition. ↑ Yong Woo on Twitter. (2014-05-30). ↑ 2.0 2.1 Ben Brode on Twitter. (2016-12-06). ↑ 3.0 3.1 3.2 Ben Brode (2018-04-20). A message from Ben Brode - Hearthstone Forums (archived copy). Retrieved on 2018-04-20. ↑ 4.0 4.1 "Chief Creative Officer at @SecondDinner. Previously Hearthstone Game Director @ Blizzard." —Ben Brode Twitter description. Retrieved on 2018-07-12. ↑ Ben Brode (2014-05-07). Twitter / bbrode. ↑ Ben Brode on Twitter. (2015-08-14). ↑ Ben Brode - How to Get a Job in the Games Industry. (2015-09-04). ↑ 9.0 9.1 Blizzard ANZ on Twitter. (2016-08-02). ↑ 10.0 10.1 Ben Brode on Twitter. (2017-02-16). ↑ Ben Brode on Twitter. (2016-04-18). ↑ Ben Brode on Twitter. (2016-07-15). ↑ Ben Brode on Twitch (11:40). (2016-04-17). ↑ 16.0 16.1 16.2 Mark Serrels, Kotaku.com (2014-05-04). Pens, Paper And Envelopes: The Making Of Hearthstone. ↑ Ben Brode on Twitter. (2015-03-03). ↑ Ben Brode on Twitter. (2015-06-17). ↑ Ben Brode on Twitter. (2016-07-04). ↑ Ben Brode (2017-10-05). Ben Brode - Design Lessons from Improv. YouTube. Retrieved on 2018-04-20. ↑ Ben Brode on Twitter. (2016-12-07). ↑ Chua Zhihong on Twitter. (2016-12-05). ↑ Confirmed by Yong Woo in conversation with User:Taohinton: Blizzard personnel tend to fulfil a role for some time before being officially promoted. ↑ Ben Brode on Twitter. (2016-07-05). ↑ Ben Brode on Twitter. (2016-07-17). ↑ Ben Brode on Twitter. (2016-11-05). ↑ Hearthstone Game Director caves to community; raps about new expansion. (2017-03-01). ↑ Ben Brode on Twitter. (2017-03-01). ↑ Powerchicken on Twitter. (2017-03-01). ↑ Top posts of /r/hearthstone. Retrieved on 2017-03-09. ↑ /r/topofreddit. Retrieved on 2017-03-02. ↑ Ben Brode on Twitter. (2017-03-03). ↑ Ben Brode on Twitter. (2017-03-09). ↑ Ben Brode on Twitter. (2017-07-31). ↑ Ben Brode - "ARTHAS" (The story of Arthas, performed as a rap, because I'm SUPER excited for the new Hearthstone expansion!). (2017-07-31). Retrieved on 2017-07-31. ↑ Ben brode on reddit. (2017-07-31). Retrieved on 2017-07-31. ↑ Ben Brode - ARTHAS, video description. (2017-07-31). Retrieved on 2018-04-21. ↑ Ben Brode on Twitter. (2018-04-20). ↑ Ben Brode on Twitter. (2018-11-02). ↑ Second Dinner on Twitter. (2018-07-12). ↑ Ben Brode on Twitter. (2018-07-12). ↑ Bob Fitch on Twitter. (2015-10-02). ↑ Greg Street on Ask.fm. (2016-10-11). ↑ Ben Brode on Twitter. (2014-11-25). ↑ Ben Brode on Twitter. (2014-11-14). ↑ Ben Brode with the original of Fireball. ↑ Ben Brode on Twitter. (2018-10-31). ↑ Ben Brode on Twitter. (2016-08-02). ↑ Ben Brode on Twitter. (2016-08-26). ↑ Ben Brode on Twitter. (2016-11-12). ↑ Ben Brode on Twitter. (2015-01-03). ↑ Ben Brode on Twitter. (2017-03-08). ↑ Ben Brode on reddit. (2017-07-15). ↑ 69.0 69.1 Ben Brode on Twitter. (2014-06-03). ↑ Ben Brode on Twitter. (2017-03-06). ↑ Ben Brode on Twitter. (2015-06-16). ↑ 73.0 73.1 Ben Brode quoted on reddit. (2016-10-03). ↑ Ben Brode on Twitter. (2015-09-29). ↑ Ben Brode on reddit. (2017-07-14). ↑ Matt Dixon on Twitter. (2016-11-28). ↑ Ben Brode on Twitter. (2017-03-05). ↑ Salutations from all of us, on this wonderful Ben Brode day! ↑ Ben Brode on Twitter. (2018-10-30). This page was last edited on 13 November 2018, at 12:34.